Lisa Fredenburgh works with AU students. In recent years, AU has seen a resurgence of the arts, a reaffirmation of the study and appreciation of creative expression, and the return of music to campus life. And the driving force behind this renaissance is Lisa Fredenburgh, Associate Professor of Music, Program Chair and Director of Choral Activities. 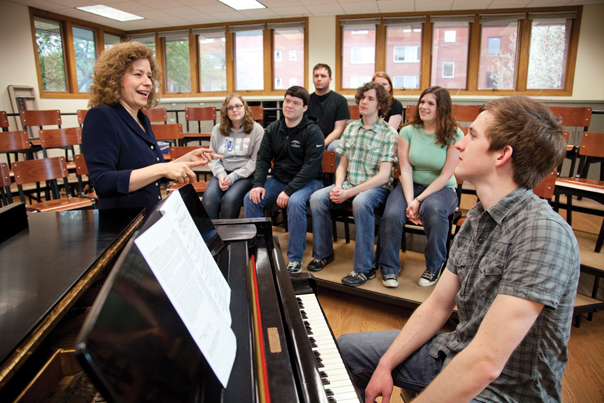 Building upon the work of her predecessors, Fredenburgh has created an academic department that serves more than just music majors. Not only has she expanded and enriched the music curriculum, she has created opportunities for AU musicians—both students and faculty—to share their talents with the entire campus community. Students also inspire Fredenburgh. “While they have a wonderful joie de vivre, students also understand that a large task requires great effort on their part,” she said. “With encouragement, they are willing to risk themselves intellectually and emotionally to gain the skills music requires. I admire their courage and dedication. On Friday, March 1, Fredenburgh will lead the AU Choirs as they head out on a five-day Choir Tour, performing at schools, churches and museums in Illinois and Missouri March 1-5. You can follow along with their journey through the Aurora University Music Department Facebook group or on the Aurora University Music Department blog.